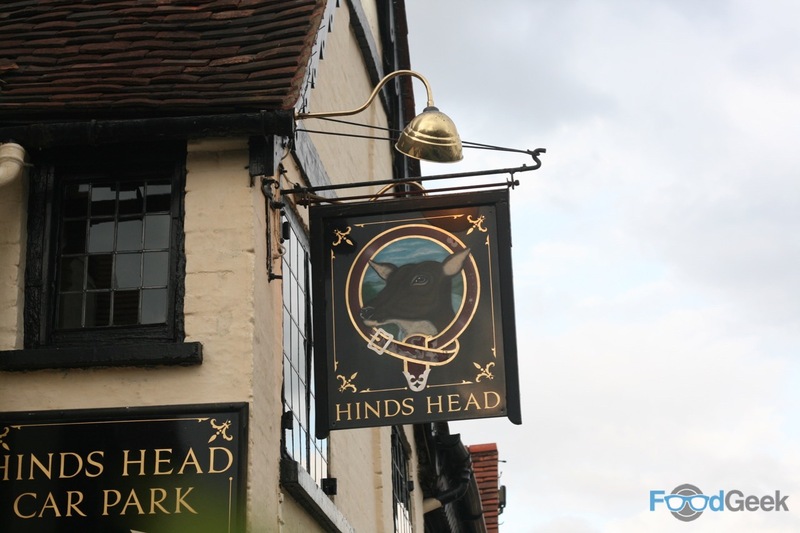 Almost four years had passed since I last visited Heston Blumenthal’s Michelin-starred pub The Hind’s Head. I could probably count the number of weeks I’ve not thought about their scotch eggs on one hand. The 15th-century pub is located in the UK’s culinary hotspot, the tiny and very pretty village of Bray. Home to half of the country’s four 3 Michelin starred restaurants. 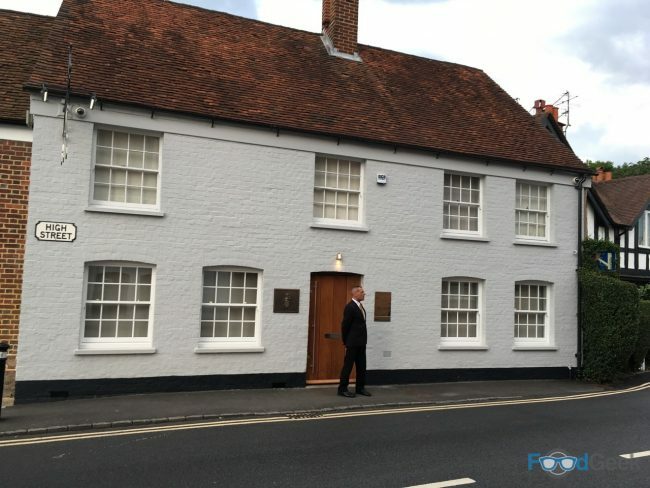 Including Heston’s other place, The Fat Duck, just a few doors down. 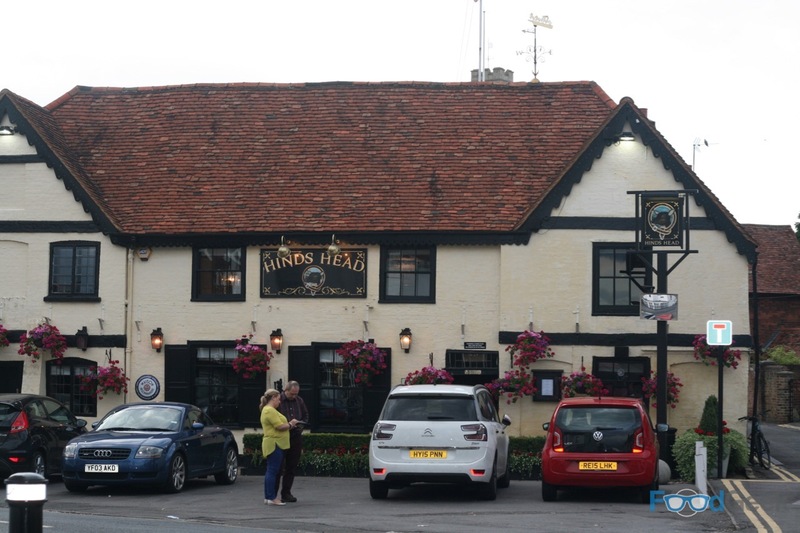 Inside is warm and comforting, with a genuine old fashioned country pub vibe. Tudor style (I think) low ceilings, wooden beams and paintings and artefacts depicting country life. The dining room is a little more restaurant like but still quite rustic and very cosy. 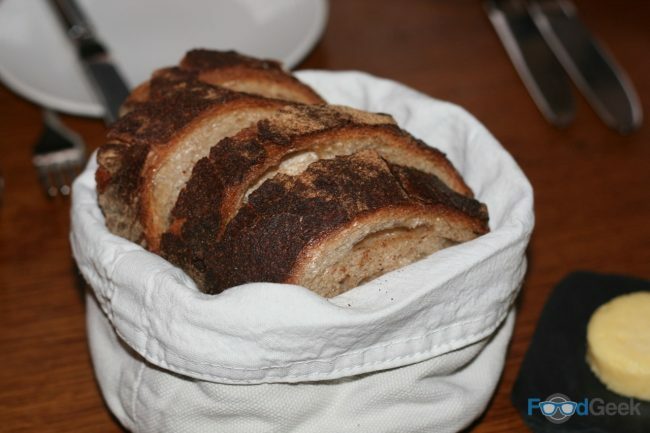 We were offered complimentary bread to start. Fresh and crusty with lovely salted butter. And then the holy grail. The famous scotch egg. You’d think with how much I’ve wanted one over the last four years it couldn’t possibly live up to my expectations, right? Nope. They were every bit as good as I remembered. 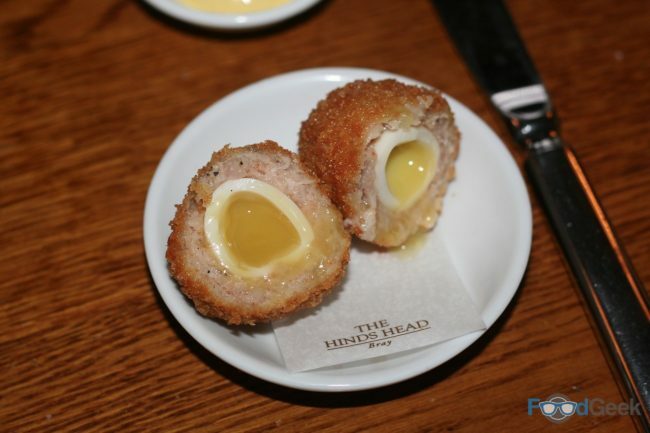 Crisp, golden breadcrumbs, juicy sausage meat, and a soft quails egg with perfect runny yolk. There’s just a hint of spice in there too. So simple in a way but perfectly executed. I’d honestly have been happy to have a bowlful and nothing else. That would make for a very dull review, though. So of course, I ordered a main course as well. A whole filleted Plaice was beautifully cooked, the flesh flaked away so easily. 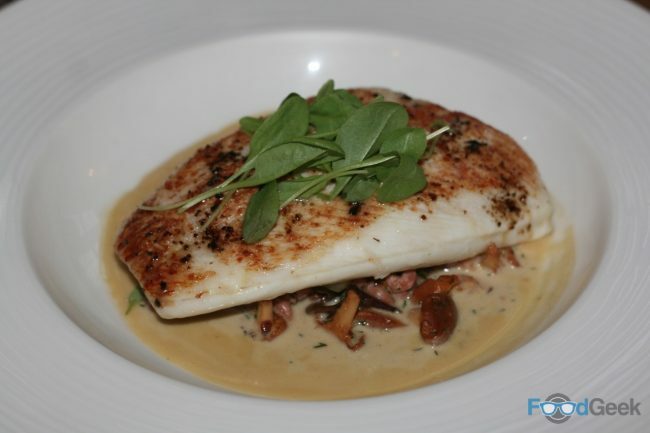 It was served with brown shrimps, Girolle mushrooms and cucumber. And a sauce bursting with citrus flavour. I found the inclusion of cucumber unusual at first but it added a subtle flavour and freshness to balance the earthy mushrooms and salty shrimp. 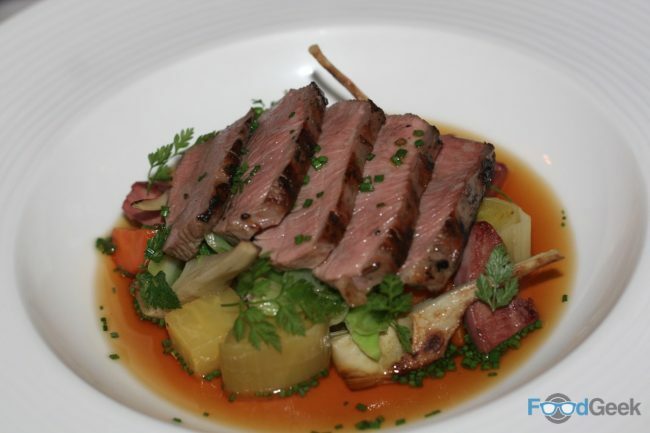 Mrs FG’s ‘Saddle of Lamb’ was also excellent. Quite a hearty dish, especially for summer. The pink and juicy meat came in a Scotch broth with artichokes, hispi cabbage and pearl barley. On my last visit, I had probably the best savoury pudding I’ve ever eaten. This time, one of the best pies I’ve ever had. 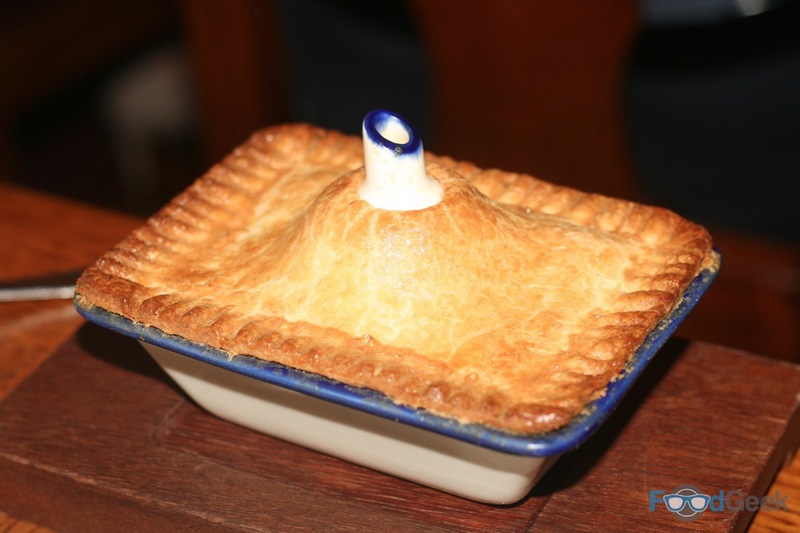 The ’Chicken, Ham and Leek’ raised pie was fantastic. 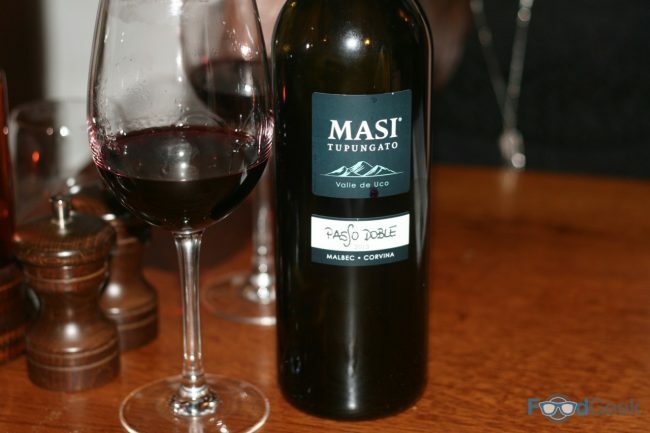 It’s a classic Heston recipe that I’ve seen him cook on TV and in cookbooks. The pastry is immense and inside is pretty great too. The chicken – thigh not breast, naturally – is sous-vide so it’s super moist, succulent and full of flavour. Along with the leeks, salty ham and wholegrain mustard cream sauce, it’s comfort food heaven. We also ordered a number of sides to share. 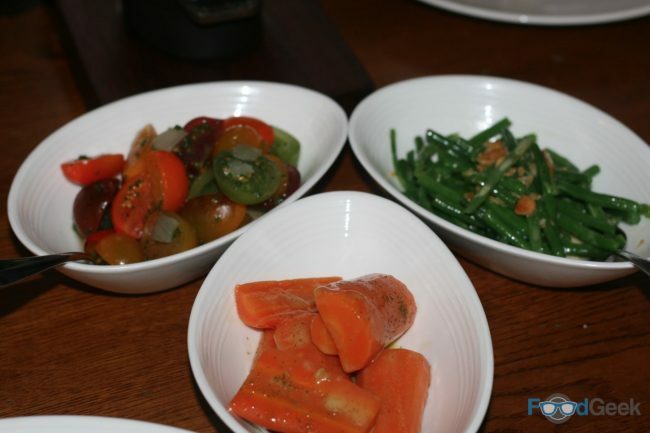 ‘Heritage Tomato and Onion Salad’, ‘Green Beans with Smoked Almonds’ and ‘Buttered Bay Carrots’. All were very good. The tomatoes incredibly fresh and flavoursome, carrots lovely and sweet with loads of butter, and smoked almonds with green beans is a revelation. The excellence continued with dessert. A ‘Strawberry Tart’ was very neatly formed. 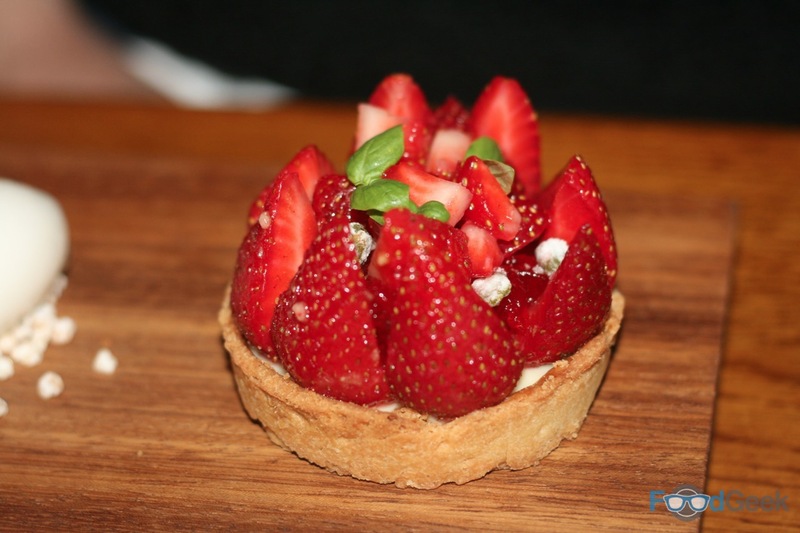 Crisp pastry topped with sweet, juicy strawberries and a touch of basil. Served with a floral and zingy elderflower sorbet it was the perfect summer dish. I enjoyed our second dessert but found the presentation a little unnecessary. I mean, it looked pretty. But it’s not really a cheesecake is it? Nevertheless, it tasted amazing. A perfect sphere of cheesecake with a liquid raspberry centre and the biscuit ‘base’ sprinkled around it. Topped with delicious biscuit flavoured ice cream. 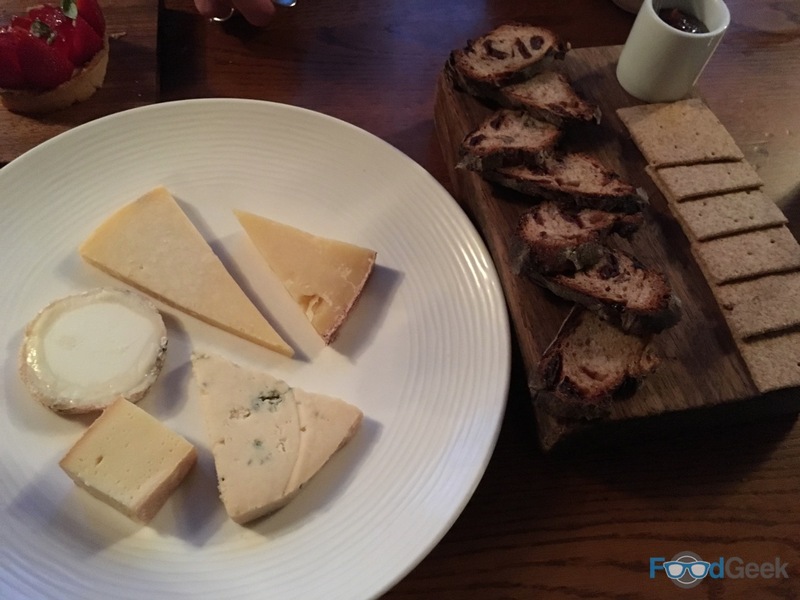 We finished with a nice plate of British cheeses. Roll Right, Stawley, Lincolnshire Poacher, Mrs Kirkham’s Lancashire and Devon Blue, with brown bread crackers and pear chutney. 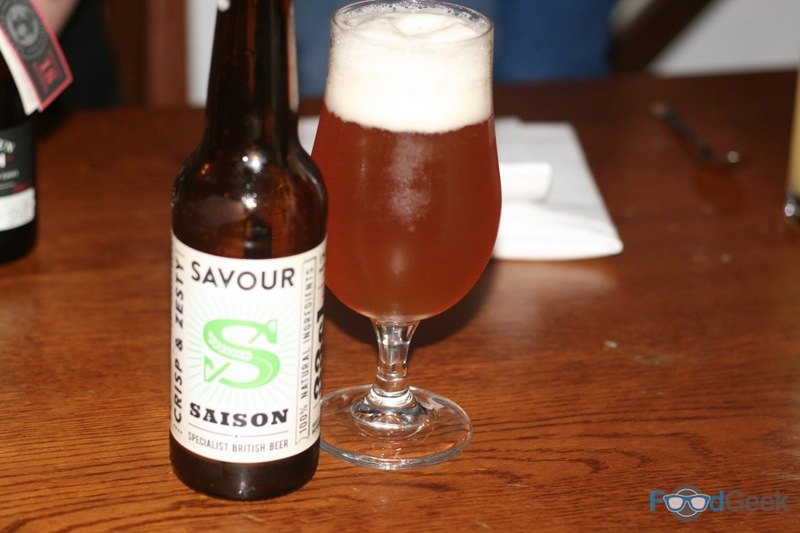 After enjoying a good bottle of red with the meal it was nice to grab a couple of decent beers with the cheese. I was particularly impressed to find Harviestoun Old Dubh behind the bar. A rich imperial stout that’s been aged in 18-year-old whisky casks. The perfect night cap. 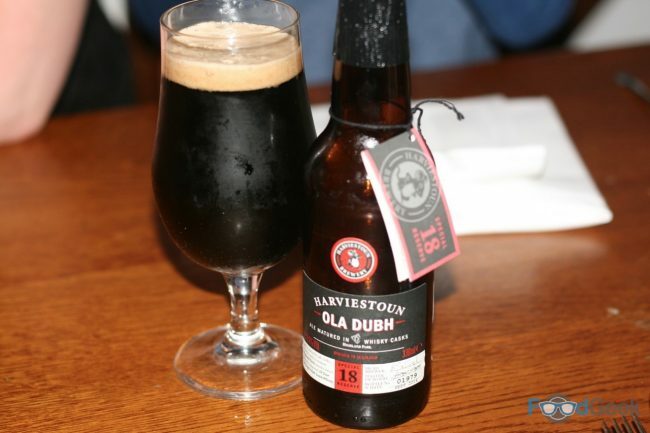 I was particularly impressed to find Harviestoun Old Dubh behind the bar. A rich imperial stout that’s been aged in 18-year-old whisky casks. Great with blue cheese and the perfect night cap. 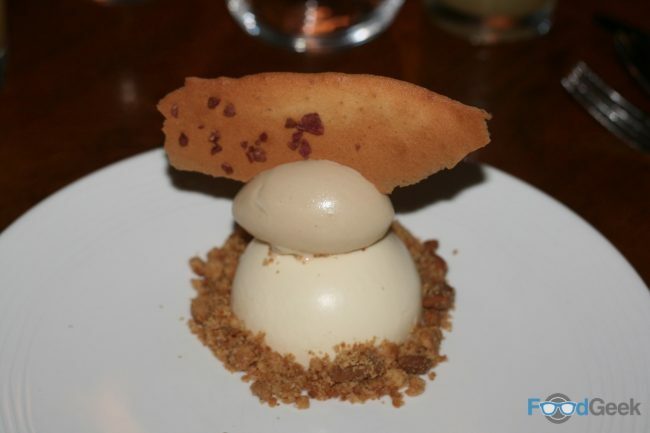 Whilst waiting for a taxi in the bar we were offered a sneak peek at Heston’s latest creation. 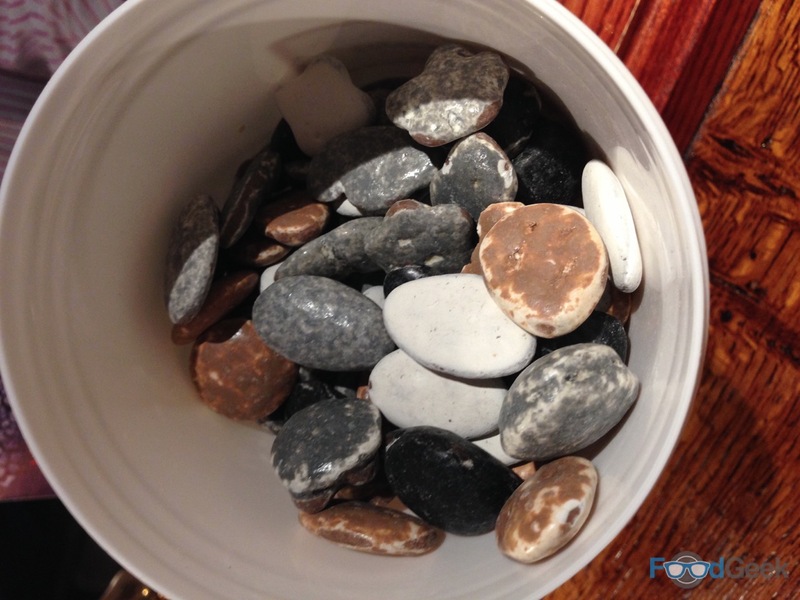 Impressively realistic looking chocolate stones! They looked great and tasted like the best chocolates ever, I expect they’re going to end up on some fancy dessert at The Fat Duck. Giving me even more reason to return. 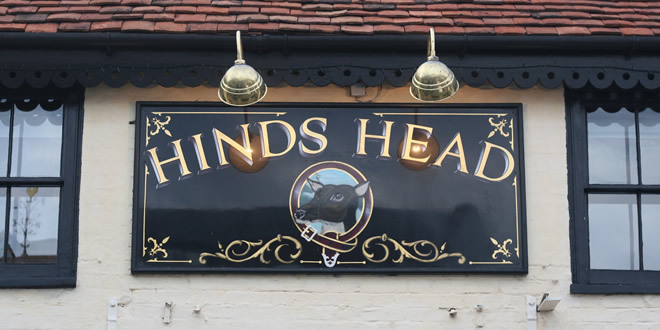 It’s always slightly nervous going back to somewhere you loved but the Hinds Head didn’t let me down. If anything the overall experience was probably better than last time. Service was spot on, they’ve really got the balance right between highly attentive yet informal and relaxed. And the food was every bit as good, including the scotch eggs. Really the only disappointment was the lack of snails and triple cooked chips on the menu. But at least it gave me chance to try new things that I wouldn’t have been able to otherwise. And It’s made me determined to come back sooner than last time. 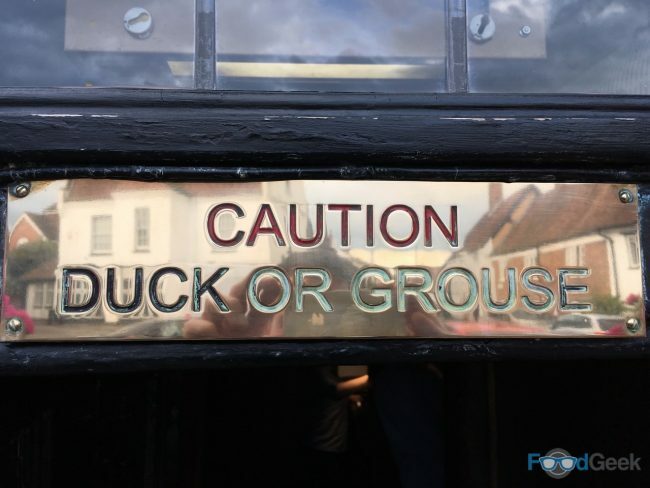 Maybe for the Fat Duck double bill again?